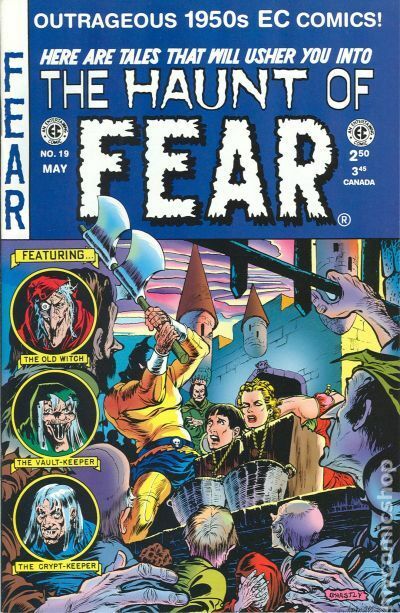 Cover pencils by Gil Kane, inks by Ernie Chan. "The Enchanter's Apprentice! 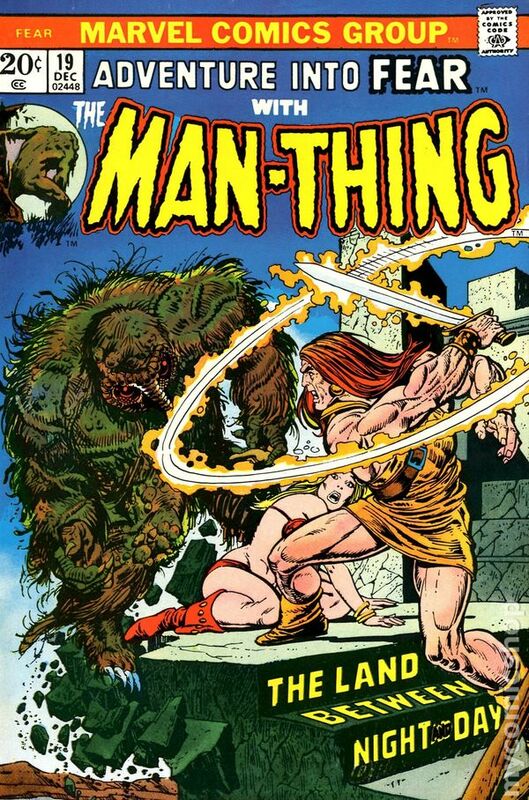 ", script by Steve Gerber, pencils by Val Mayerik, inks by Sal Trapani; As an improbable battle rages on below the castle, Man-Thing is picked up by Jennifer Kale, with the savage Korrek following from behind; Korrek catches up with Kale and the Man-Thing and attacks the two of them; Jennifer suddenly awakens screaming, and as her brother and grandfather burst into the room to reassure her it's all a dream; However, Joshua Kale has his doubts that his granddaughters nightmares being just dreams; His suspicions are validated when Korrek is transported to Earth's dimension through a jar of peanut butter and resumes his attack on Jennifer; However, when Joshua and Andy burst into the room, Korrek believes himself surrounded and flees into the swamp; The Kales are soon visited by Dahkim the Mystic who has come to tell the Kales about the disruption in the Nexus of Realities caused by the construction being done in the swamp; Korrek is visited by Howard the Duck, who has also found himself transported to Earth's dimension as well. Man-Thing stories continue in Man-Thing #1. 36 pgs., full color. Cover price $0.20. Published May 1997 by Gemstone. 1992-99 RC/Gemstone reprint series. This series can easily be confused with the original series (10c cover priced), the 1990-91 Gladstone reprint series, or 1991-92 Russ Cochran reprint series. Cover art by Graham Ingels. Sucker Bait!, script by Albert B. Feldstein, art by Graham Ingels; After his father is killed by a vampire, a chemist comes up with a plan to sacrifice himself so that others may live. Lover, Come Hack To Me!, script by Albert B. Feldstein, art by George Evans; Every generation, a madwoman is conceived on the night of her parent's wedding who follows the tradition of murdering her newly-wed husband with an ax in the same house. Double-Header!, script by Albert B. Feldstein, art by Jack Kamen. Foul Play!, script by Albert B. Feldstein, art by Jack Davis. 36 pgs., full color. $2.50. Cover price $2.50. 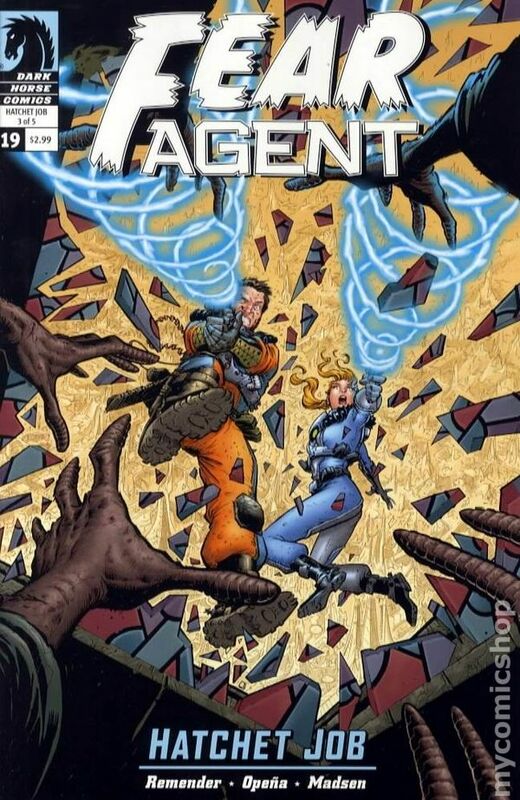 Published Mar 2008 by Dark Horse. RICK REMENDER (W), JEROME OPEÑA (P), and MICHELLE MADSEN (C) While investigating the fate of Charlotte and her crew Heath follows a series of clues that leave him stranded on a haunted planet surrounded by soul eating ghouls. When a terrible plot by a traitor in their midst is uncovered Heath and Char must find a way off the ghost world to warn the remaining human population of the danger. Beware the ghouls of a planet haunted! Cover price $2.99. Published Jun 1953 by EC. 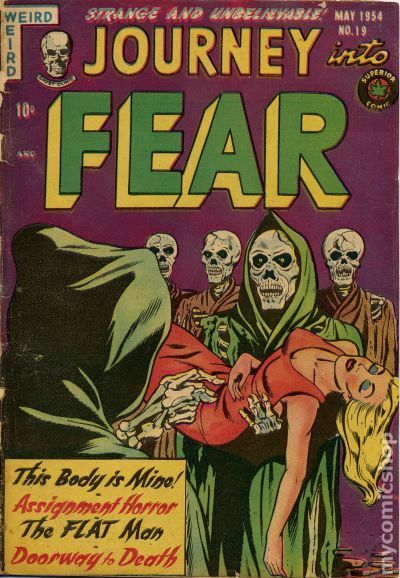 Cover art by Graham Ingels. Sucker Bait!--The Witch's Cauldron!, script by Albert B. Feldstein, art by Graham Ingels; After his father is killed by a vampire, a chemist comes up with a plan to sacrifice himself so that others may live. Lover, Come Hack to Me!--The Vault of Horror!, script by Albert B. Feldstein, art by George Evans; Every generation, a madwoman is conceived on the night of her parent's wedding who follows the tradition of murdering her newly-wed husband with an ax in the same house. Double-Header!--The Old Witch's Grim Fairy Tale!, script by Albert B. Feldstein, art by Jack Kamen. 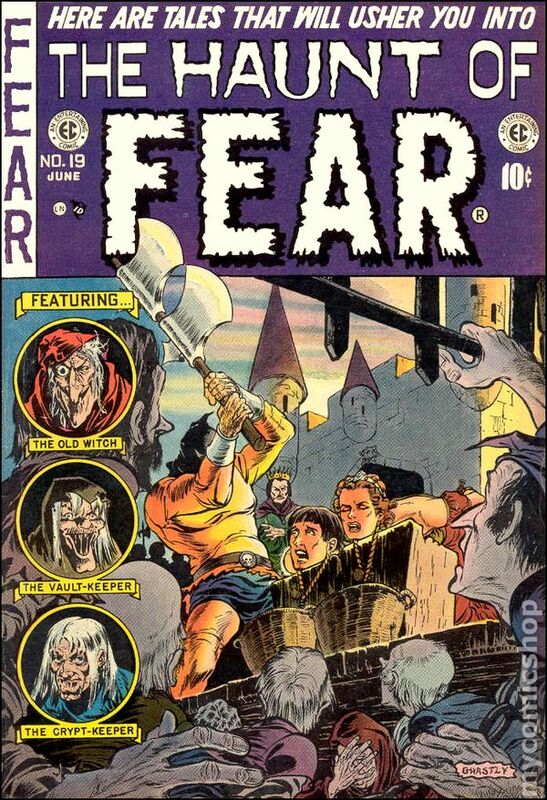 Foul Play!--The Crypt of Terror, script by Albert B. Feldstein, art by Jack Davis. 36 pgs. $0.10. Cover price $0.10. Published May 1954 by Superior-Dynamic. Doorway to Death; Art collector Guy Stevens buys a large painting of a castle and discovers that he can open the door in the painting; He begins murdering people and hiding their bodies in the painting. Assignment Horror; Harold goes to an ad agency to promote a movie about giant frogs that conquer the world. Sacrifice to Kaste text story. This Body is Mine! The Flat Man; A man becomes the Flat Man by being run over by a bulldozer. 36 pgs. $0.10. Cover price $0.10. Mark Jewelers Advertisement Insert Variant. 1st appearance Howard the Duck - Man-Thing stars in "The Enchanter's Apprentice!" Script by Steve Gerber, pencils by Val Mayerik, inks by Sal Trapani. First appearance of Howard the Duck (cameo). 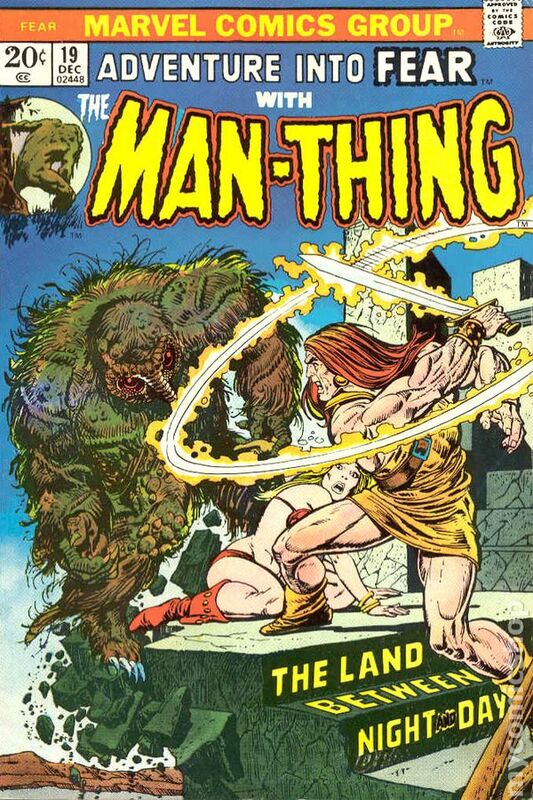 Final appearance of Man-Thing in Fear; story continues in Man-Thing 1 (1974). Gil Kane cover pencils (Ernie Chan inks?). Cover price $0.20. Cover price $0.20.